3)	architects, engineers, and other designers of government buildings. 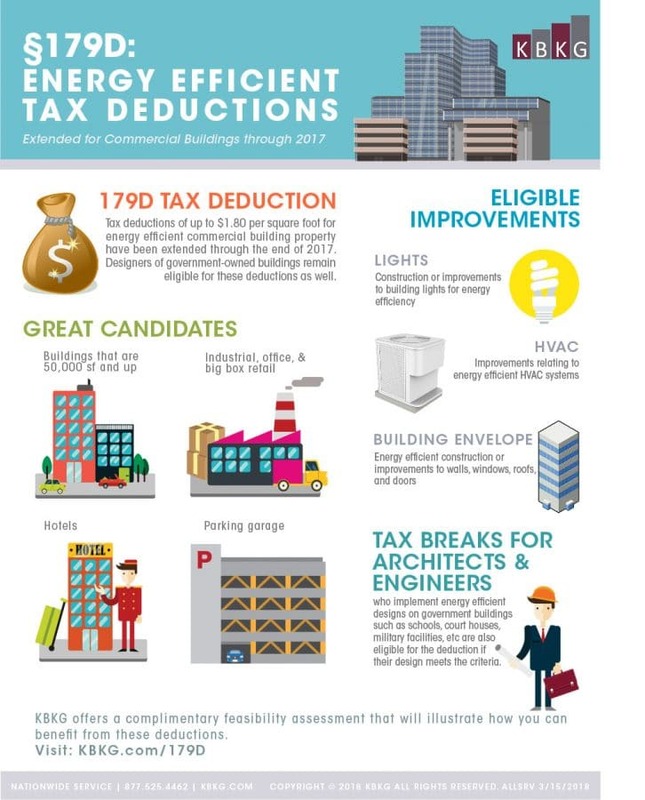 The tax deduction is worth up to $1.80 per square foot and available to those investing in energy efficient improvements. Eligible improvements can be from any of the following categories: the building envelope, HVAC & hot water systems, and/or interior lighting systems. For a concise description of the 179D tax deduction, we’ve created this infographic. Have questions about 179D? We have answers. Contact our 179D experts today to see if you or your client qualifies for the deduction. KBKG offers a complimentary feasibility assessment that will illustrate how you can benefit from these deductions. Get started today with a feasibility assessment.